Powers/Abilities: Emits blue rays from his eyes at all times, allowing him to see through solid objects and read minds. He hides his unusual eyes behind opaque glasses. As well as his powers, Hyde was an inventive genius. In his walking stick, Hyde carries a "whole arsenal" of hidden weapons, "some of them highly unusual". One such weapon was the Buzzing Bees, a swarm of tiny metal insects which vibrated so rapidly that anyone touched by them would instantly stun the victim. History: Accidental exposure to a form of natural radiation had caused scientist Jason Hyde's eyes to turn colourless and emit x-rays which gave him the power to see through solid objects and read minds. "Jason Hyde was an investigator into the weird and extraordinary and, because of his search into the unknown, he had become strikingly unusual himself. The strangest thing about him was the pale blue rays which shone from his completely white eyes. This astonishing feature, which he had gained accidentally from exposure to a form of natural radiation, gave him the ability to see through solid objects and to read the thoughts of human beings." Comments: Text character, described as very tall and dressed in old-fashioned black clothes. Written by science fiction novelist Barrington J. Bayley, and illustrated by Eric Bradbury. 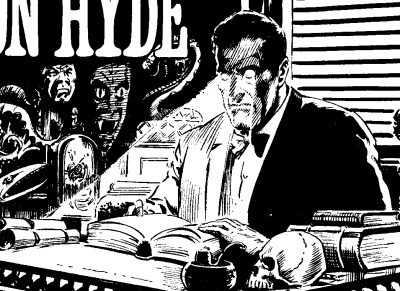 Hyde's powers sounds a lot like Johnny Alpha's, which might mean that later character copied this idea.